The health care industry in Kentucky is a crucial and active part of the state's economy. The Bluegrass State is home to well-known health care companies, including Humana, and award-winning hospitals. Since January 2014, growth in the health and social assistance sector has outpaced state-wide employment growth, with more than 10,000 jobs added in the past two years, according to data from the Kentucky Center for Economic Policy. The state projects health care support jobs will continue to be the fastest expanding occupational group with an estimated 23 percent growth through 2022. Many of the jobs are expected to be new opportunities rather than replacement positions. A career as a medical assistant could offer an excellent opportunity to be a part of Kentucky's economic success. A new career in medical assisting requires a certificate or degree in the field from an accredited institution. Graduates are able to get in on the ground floor of the health care industry, helping other professionals and patients in clinics, hospitals and physician offices. To get started, it’s important to do your research and find the program that fits your personal and professional needs. 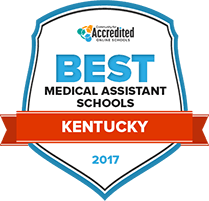 We’re meeting you halfway by providing this list of the Best Medical Assisting Colleges in Kentucky for 2017. See who made the cut below. With an 87.5 percent job placement rate over the past five years, it is clear why Henderson Community College’s medical assisting program is beneficial for students interested in beginning a career in the medical field. Students will progress through a curriculum that revolves around learning to perform a series of basic and advanced medical examinations, familiarizing students with the administrative side of working in the medical field, and developing a broad knowledge of human anatomy and physiology. By enrolling at Henderson, students become an active member of a lively academic community characterized by regular community service opportunities, academic integrity, and social inclusiveness. Over the last five years, employers have expressed a 100 percent satisfaction rate with medical assistants that have graduated from one of Bluegrass Community and Technical College’s medical assisting programs. While studying in a BCTC program, students will become fluent in their area of emphasis, but will also develop a broad understanding of a variety of fields through a well-rounded general education curriculum. Learning is a collaborative effort at BCTC, which is why they strive to develop the smallest classes possible, allowing for close interaction between classmates and professors. Most BCTC programs can be completed in as few as two years, allowing students to begin their careers as quickly as possible. Gateway Community and Technical College offers an associate of applied science degree in medical assisting that is designed to facilitate student job placement after the completion of two years of learning. Students studying under this program also have the opportunity to concurrently work through a corresponding certificate for phlebotomy, further increasing their marketability for possible future employers. By visiting with Gateway’s career counseling center, students will be able to develop a plan of how they will be able to achieve their career goals through proper interview and resume-building skills. Gateway students may be eligible for financial aid coverage in the form of loans, scholarships, and grants. At 60-68 credit hours, Jefferson Community and Technical College’s associate of applied science degree in medical assisting can be completed in just a few short years. JCTC’s goal is to prepare all of its students for their post-graduation pursuits, whether that is applying for jobs and beginning a career in their field of choice, or continuing into a four-year institution with a corresponding bachelor’s degree program. JCTC offers its courses in a variety of formats in hopes of making earning a degree accessible to any student; courses can be completed online, in the evening, or even in weekend class sessions. Our search tool will help you find a medical assistant program or school in Kentucky that fits your timeline and budget. Kentucky does not require medical assistants to be certified. Medical assistants are considered unlicensed personnel and can perform routine clinical tasks delegated to them by a physician or nurse. These tasks must be within the scope of practice for the supervising staff member, whether a physician or nurse, and not prohibited by law. Is certification available in Kentucky? Although Kentucky does not require medical assistants to be certified, employers increasingly require certification. Graduates of medical assistant programs in Kentucky are eligible to sit for national certification exams. Some exams (e.g. the NCMA exam) allow recent work experience to take the place of formal education. Below is a list of just some of the national certifications available to prospective medical assistants. Is training or formal education required? All national certification programs for medical assistants require some formal education, typically a high school diploma or GED and the completion of an accredited medical assistant program. In many states, including Kentucky, medical assistants performing tasks such as drawing blood samples, running laboratory tests, or utilizing special equipment are required to undergo additional training that may not be included in all medical assistant programs. Are there additional requirements for medical assisting in Kentucky? Depending on the types of tasks a medical assistant is expected to perform, additional training requirements may exist. Medical assistants in Kentucky must possess the additional training or experience to perform the following procedure, for example. Use of medical laser equipment (exception for laser hair removal) Authorized for use only under the supervision of physician. Required to undergo equipment specific training and documented continuing education. Are there healthcare support tasks outside the scope of medical assistants in Kentucky? Certain clinical tasks constitute the practice of medicine and are reserved for licensed physicians, and in some cases, nurses. Kentucky does not permit medical assistants to perform the the following tasks or procedures. Although salaries vary by location, the chart below compares Kentucky medical assistants' average hourly and annual earnings with national averages. Medical assistant salaries in Kentucky's metropolitan areas, such as Lexington and Louisville, track closely with national averages. In rural areas, medical assistants earn slightly less. See the following chart for a breakdown of what medical assistants can expect in the state's various regions. According to projections by the Bureau of Labor Statistics, health care support occupations will grow at a record pace over the next decade. The Bureau includes medical assistant in its top twenty list of careers expected to have high employment growth through 2024. The outlook for Kentucky medical assistants is particularly good, with growth expected to exceed the national average by eight percent. While Kentucky is home to a number of well-known educational institutions, it also has a large network of smaller community colleges and vocational schools offering training programs, certificates, and associate degrees for prospective medical assistants. See what this spotlight school has to offer. Offers a medical assisting program focused on ambulatory settings, specifically private physician's offices. Graduates can qualified as Certified Medical Assistants (CMA), Registered Medical Assistants (RMA), National Certified Medical Assistants (NCMA), & Certified Clinical Medical Assistants (CCMA). The mission of Kentuckiana Works is to connect unemployed or underemployed individuals with training and job opportunities. It coordinates with employers throughout the state to provide pathways into a number of careers, including health care. The program's Health Career Center is located in Louisville and offers career assessments, training funds for in-demand occupations, job leads, career advice, work-based learning opportunities, and connections to top healthcare employers in the area. The Kentucky Department for Public Health lists vacancies in local health departments. The counties often have openings for health support positions in ambulatory, home, or clinical settings, and listings are organized by county. Even if a county is not currently hiring, the department provides contact information for the hiring supervisor so applicants can enquire about future opportunities. Formerly known as The Rural Assistance Center, RHIH provides information and resources about health care opportunities in Kentucky's rural areas. It also lists funding and grant sources for individuals pursuing careers in health care and health support occupations. A function of the Kentucky Department for Public Health, Train Kentucky is a community education program designed to support health professionals working in the state. The website offers continuing education courses, both on-site and distance learning, often at no cost. Create an account to maintain a record of competency-based trainings completed and receive notification about future courses that may be of interest.